Is your startup working on technologies related to AI, Machine Learning, Data Science, Computer Vision, NLP, Speech Recognition, etc.? Do you have kickass hackers in your startup who know what it takes to work with data, patterns, APIs, and visualization? You, as a startup founder want to jostle with others who breathe AI as AIR? In one day (& night if you want) you have to create an interesting working prototype leveraging IBM Watson API Suite and publicly available datasets. Register your startup to take part in this hackathon with a minimum of three team members. You will then have a chance to hire one or two developers/students temporarily for these two days to work on your prototype. A recruitment drive for adding developers and interns to your startup. Benchmark the talent of your team against other startups in ML, AI, and Analytics. Get innovate ideas that can be plugged into your product/service. Unearth a strong core team member for your startup to take over as lead or head. 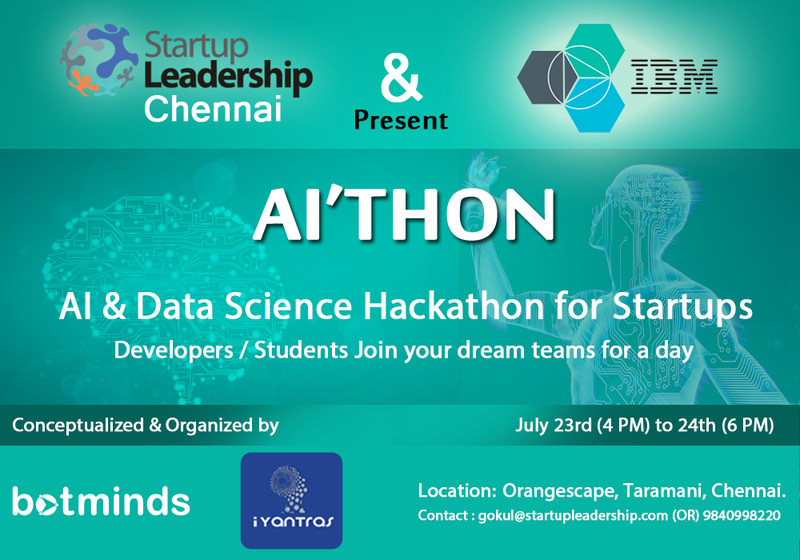 Share time & space with fellow AI Geeks, in an exciting first-of-its-kind hackathon for startups. We forecast a good number of developers & students interested in these technologies to turn up and (needs prior registration) showcase their talents by being a part of your team for two days. We have attractive prizes from our SLP Chennai Alumni, Botminds & iYantras. Your prototype will be judged based on usefulness, completeness, viability and your ability to leverage APIs and datasets on offer. You will get more details upon registration. Keynote Address: Anand Chandrasekaran, Founder, Mad Street Den. Prerequisites: Come with an open mind & your laptop armored with necessary software & hardware. We will provide food, snacks, and coffee to power you through the AI’thon. #‎Developers‬ ‪#‎students‬, Want to work in cutting edge artificial intelligence and data science? Join startups from Chennai for a day. Exciting opportunity to win your dream offer. Register now with early bird discount pass EARLYBIRD25.